John Fife: Scottish Rally Scene . I see Issue 5 of Bob Irvine's eclectic view of Scottish rallying is now on sale. However I worry about the editorial appeal of some of the content. You'll need to keep the mag out of the reach of weans and the easily offended. He's got another column from Quintin Milne and he interviews Brian Watson! Sounds like a case of a Government Health Warning is needed on the front cover. Those two aside, this month's 'In Focus' features the work of photographer Colin Smith and there are reports from Mull and Leuchars. There's also a prize crossword with 50 quid on offer for the winner and the magazine features Stonehaven & District MC as the club of the month. All that plus the usual nonsense, opinions and informed gossip. 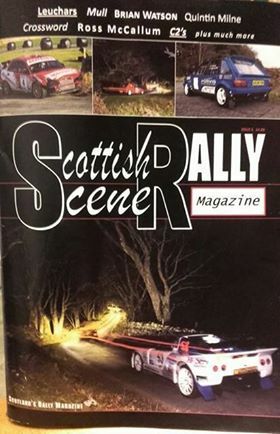 The mag is available from 'Turner Autosport', 'Mercury Motors' in Largo and at 'Scotfab' in Aberdeen or go to Ebay and type in 'Scottish Rally Scene' and you can buy it there. You get a lot of gloss and colour for your 4 quid and you also find out things you didn't know before and possibly didn't need to know. Ideal for browsing once the hangover kicks in on Boxing Day or January the 2nd.